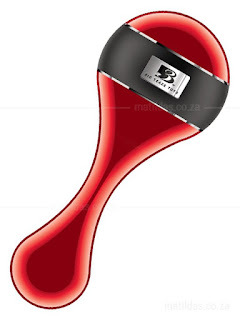 This amazing toy is made of sleek and body-safe metal with a medical-grade silicone band. At the store where I work (I started working at an adult store), we have way too many of them, so they're 70% off. It's smooth and heavy, making it perfect for solo play. While the larger end of this toy seems rather intimidating, I find that it's a very pleasant challenge. A friend of mine mention that she got this after having her first child, using it as a large kegel ball. What I like about this toy: It can be used with silicone lubricant (I know I should't with the band there, but I think it's mostly safe), it's amazing when warmed up, and it's challenging. If you're using the larger end, I suggest taking this slow for beginners. Don't rush yourself and relax. But you could use either end, depending on your mood. It also warms to your body due to it's material, keeping it comfortable as you use it. In fact, you could cool it down in the refrigerator or heat it up by boiling it or running it under hot water. For male-bodied people, the smaller end can be used for prostate stimulation. What I don't like about this toy: Because it's made of metal, it's always cold when you first go to use it, unless you're keeping it in a warm enviroment. I wasn't sure exactly which end to insert first, so I used the larger end. There was no real description on the packaging.